Pfc. 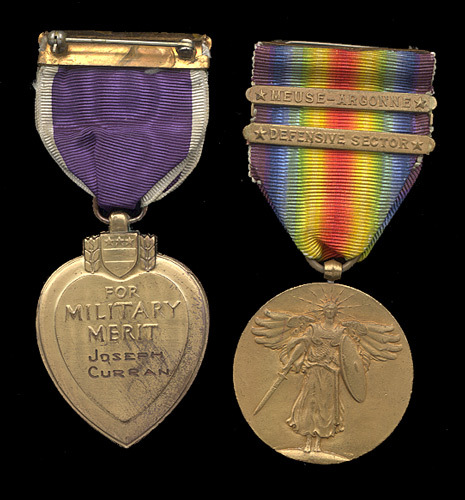 Curran's Purple Heart and Victory Medal. Pfc. Joseph Curran, 3107968, Company B, 314th Infantry Regiment, 79th Infantry Division. Wounded in Action on 29 September 1918 during the Meuse-Argonne Offensive. Born on 26 April 1890, he entered the service on 27 May 1918 from Shamokin, Pennsylvania. 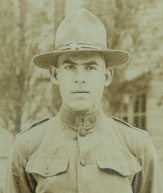 Pfc Curran served with Company B, 314th Infantry Regiment during his entire time in service from 27 May 1918 until 31 May 1919. He arrived in France on 7 July 1918 and fought in the engagements at Sector 304, the Meuse-Argonne Offensive and at Grand Montagne. On the first day of the Muese-Argonne Offensive, the 314th Infantry Regiment led the attack on Montfaucon with the 315th Infantry Regiment. They jumped off at 5:30 AM and bypassing the ruins of Malancourt at 7:30. The advanced had been covered by heavy fog, but by 9 Am the fog had lifted giving the Germans clear fields of fire on the U.S. infantry who had bunched together in the fog. The 314th Infantry was pinned down for 5 hours a half-mile north of Malancourt. They tried to move forward again at 2 PM but were quickly beat back with heavy casualties. The weakened American infantry attacked again the next morning at 4 AM and slowly advanced as the Germans were forced to withdrawal along the entire defensive line to avoid being outflanked by other American units. 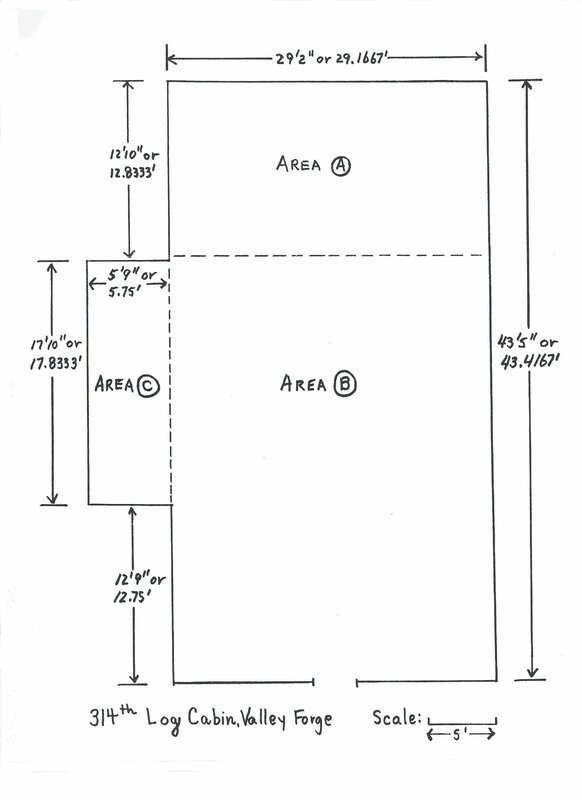 During the entire advance, the 314th was constantly shelled by German artillery. During the night of 27 September, the 315th Infantry Regiment passed through the 314th to lead the next attacks. The 314th continued to be shelled as the entire 79th Infantry Division was destroyed by the 29th. It was on this day that Pfc. Curran was wounded by shrapnel to this left hand. He received his Purple Heart on 28 January 1942.